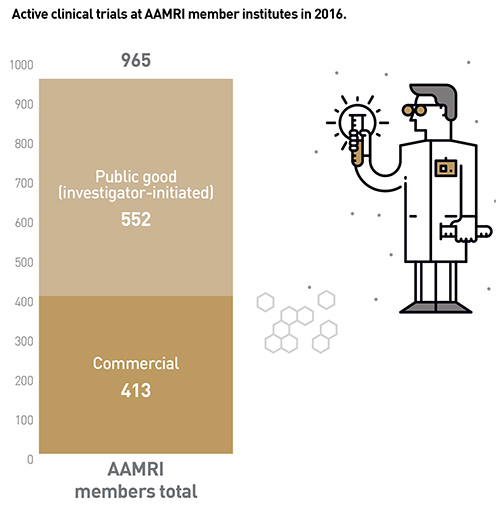 AAMRI member institutes are engaged in key stages of the research innovation and commercialisation pipeline. MRIs engage in commercialisation activities to translate their medical research discoveries into products, treatments and devices delivering both economic and health benefits. Licencing the patented technology, platform or product to commercial entities who can progress towards the marketplace. Spinning out biotech companies based on medical research discoveries, platform technologies, treatments and devices developed at the institute. 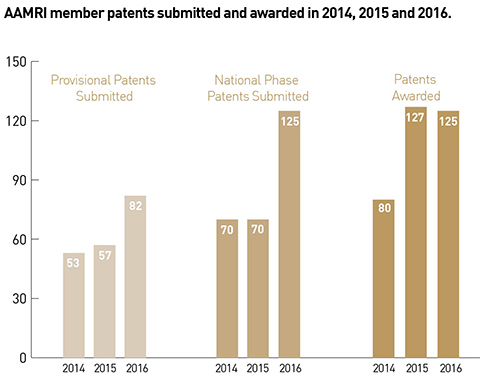 MRIs were awarded 125 patents in 2016. 13 new spin-out companies will turn medical research discoveries into new treatments, devices and diagnostics. MRIs were involved in over 900 clinical trials. Clinical trials are one aspect of medical research that has received increased attention in recent years. Many MRIs are involved in clinical trials in a variety of health areas which are financially supported through government organisations such as the NHMRC, or through industry via collaboration or contracted research. Clinical trials play an integral role in translation of health and medical research into health outcomes, by generating an evidence base for progressing through a commercialisation pathway or guiding health policies and best practice. 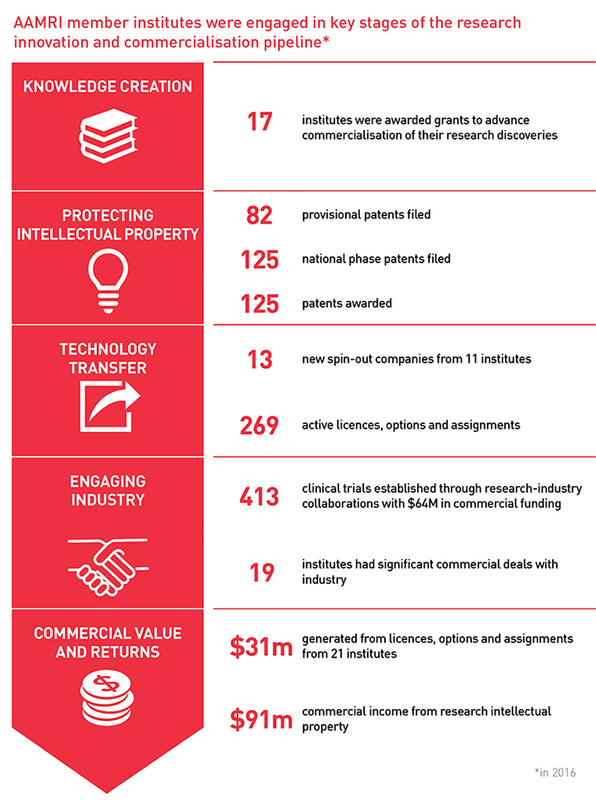 Like most systemic costs of research at MRIs, commercialisation activities are funded from a variety of sources such as government competitive schemes (NHMRC and ARC). As with research grants, there are restrictions on how the funds can be spent. Commercialisation activities are also funded from discretionary institute revenue such as commercial income generated by the institute through licencing, royalties and other returns from research IP at the institute.